APTSol thank to the Inter-University Consortium Teferco Innova will participate in the prestigious event AFI Symposium Rimini 8-9-10 June 2016. Come and visit us to find out what APTSol can do for your business. APTSol thank to the Inter-University Consortium Teferco Innova will participate in the prestigious event Pharmintech 2016 (Bologna 13 to 15 April). We will be located in the innovation and education, come and visit us to find out what APTSol can do for your business. APTSol Team is always at the forefront in research in the field of pharmaceutical technology. 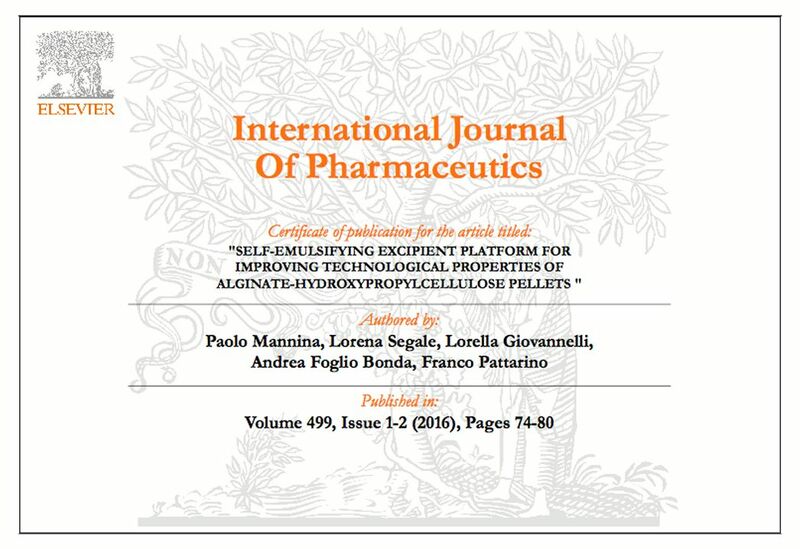 As evidence here is the recent study published in the leading journal "International Journal of Pharmaceutics" entitled "Self-emulsifying excipient platform for improving technological properties of alginate-hydroxypropylcellulose pellets"
Below is a brief summary of the work done. Pellets based on alginate or alginate/hydroxypropylcellulose mixture or alginate/pectin mixture containing an active principle model (ibuprofen) were produced with the technique of inotropic gelation. The drug was dispersed in the polymer solution or dissolved in a self-emulsifier phase that can improve the biopharmaceutical properties of the pellets. There were obtained 8 different formulations that were characterized with sophisticated techniques (DSC, dissolution assay). The study has provided interesting results: the formulations comprise alginate and hydroxypropyl cellulose and containing the drug dissolved in the self-emulsifying phase have shown the ability to release the active ingredient in a controlled manner. A further demonstration of how, thanks to a proper formulation study, it is possible to obtain pharmaceutical forms with improved technological capabilities and biopharmaceutical. New scientific publication for the APTSol Team. This time the leading journal "European Journal of Pharmaceutical Sciences" with the article entitled "Nanonized itraconazole powders for extemporary oral suspensions: Role of formulation components Studied by a mixture design"
We produced powders containing itraconazole nano-crystals through the combination of High Pressure Homogenization and Spray Drying techniques. These powders have been developed with the intent to use it as a production intermediate for the preparation of extemporary oral suspensions. The role of the various components in getting readily redispersible powder was evaluated through a study of mixtures. The systems obtained showed a greater dissolution performance compared to the untreated product with the techniques adopted, all to the advantage of a better gastro-intestinal absorption of the active ingredient.